This one's from the delightful sdk! Tagging just ten is going to be tough since I love you ALL! Let's see. I tag: lilyseyes, torino10154, enchanted_jae, capitu, digthewriter, shaddyr, corvidology, shadowycat, sassy_cissa, brumeier and, a bonus eleventh, just because smallhobbit. <3. Go check it out, it is awesome and fun and made me chuckle aloud! Harry Potter to Severus Snape: Limerick. Eee, thank you to digthewriter for the Burlington postcard! She wrote an adorable Charlie/Draco story which you can read on DW or Tumblr. In case you're unaware of our ~tradition, every year, Jae writes me a half-drabble for my half birthday in February. 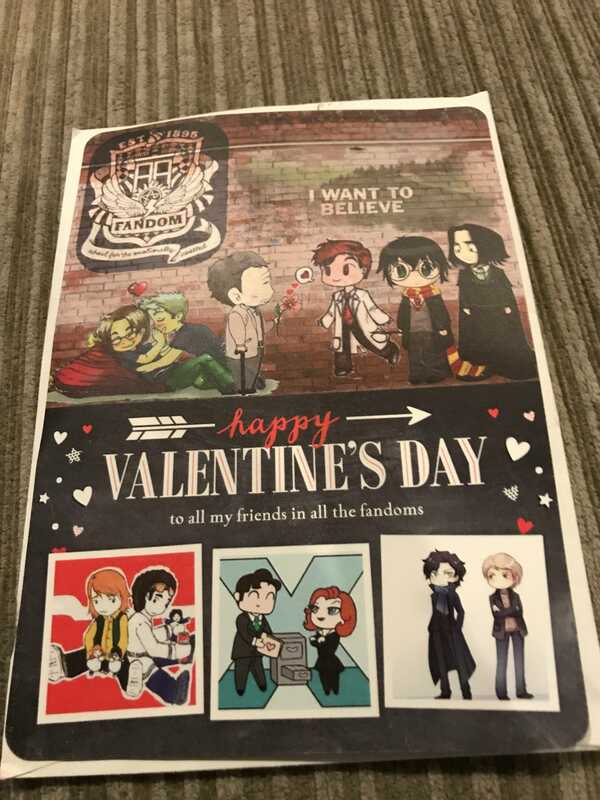 Thank you, mrs_sweetpeach for the Valentine's Day Card! Thank you to digthewriter and enchanted_jae for the Valentine's Day cards!